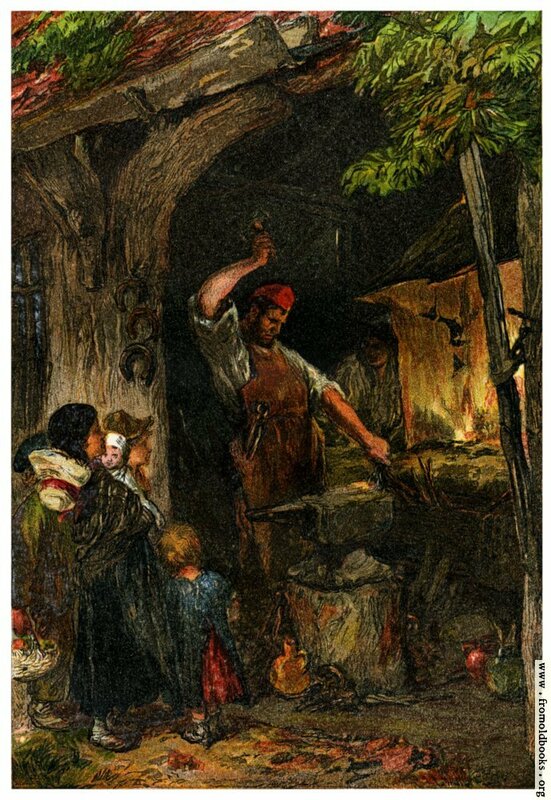 The blacksmith stands wearing his boiler suit; he has a hammer in one upraised hand ready to strike hot metal on his anvil; perhaps he is making a horseshoe or maybe it’s a manacle for a slave. In the background his apprentice keeps the fire going; in the foreground, standing next to a mighty tree whose branches seem to support the roof of the smithy, we see a woman with two children. When horses were as common as the automobile is today, the blacksmith’s smithy was as frequent a sight as the car mechanic’s shop today. 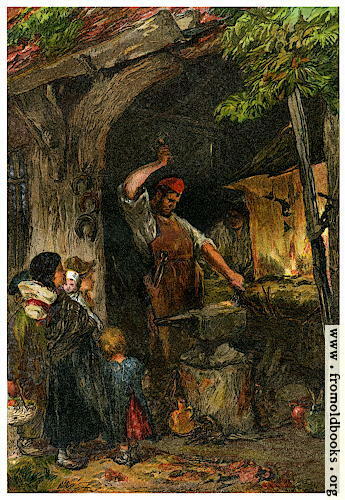 However dull and sleepy our village may have been, there was always life and stir at the blacksmith’s forge. On a sultry July afternoon, when the only sounds to be heard were the drowsy hum of a blue-bottle in a corner of the room, or the angry buzzing of a bewildered wasp against the window-pane, one had but to turn round the corner of “the street” and find amusement and occupation at the door of our local Vulcan. The sharp musical ring of hammers was always to be heard, and the gossip of the country side was in constant flow. The waggoner from Mobberley has brought a couple of his horses to be shod. Farmer Morris, of the Cow-trees, has ridden over to get a new fastening for his barn door. Young Squire Jenkins wants a dog collar mended. Their horses are safely tethered outside under the trees, quietly champing their oats and chopped straw. Pert, saucy sparrows are enjoying a banquet from the crumbs that fall from the rich man’s table: for, be it observed that we cannot feed ourselves or our dependents without giving the wild things of Nature a share. If we sow our corn, the birds of the air will help themselves to a portion. He who cares for the sparrows, claims at least a tithe for them, and the veriest miser cannot withhold it, if he would. Through some hole in the sack our superfluity escapes to feed them. And so round the tethered horses of the farmers there assembles a levée of hungry dependents, who gather up the fragments, that nothing be lost. Lounging in the door-way are the customers waiting till Vulcan, and his attendant Cyclops, have finished the job in hand.